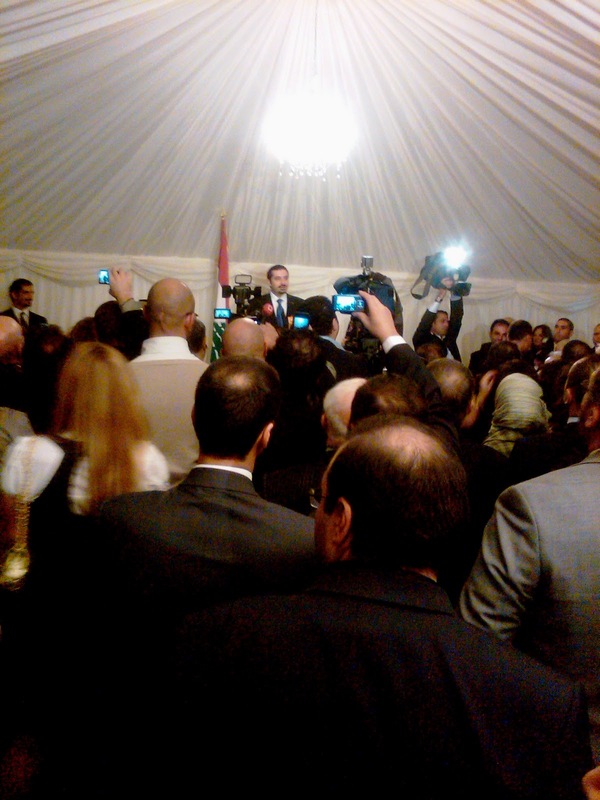 Yesterday night I came face to face with Saad Hariri for the first time. I had shaken hands in a past life with his late father more than 12 years ago and was looking forward to draw a comparison between father and son. The Lebanese Embassy in London provided the backdrop to an evening reception where the banking industry was overrepresented. Having sampled the canapés and exchanged opinions on the resilience of the Lebanese economy, they laid down their glasses to clap in their hero as he appeared past a group of heavily botoxed ladies. A friend pointed out that Saad Hariri looked a defeated man. Perhaps I thought! I rather found that his tone, posture and demeanour still revealed a degree of discomfort in his role, despite the 5 years of experience as heir to his father’s political legacy. There is no doubting the young prime minister's accessibility. A credit to someone raised in the ivory towers of wealth and in a region where leaders’ interactions with the common people is rehearsed up to the smallest handshake. As the ceremony was coming to an end, we had full access to the figure if not the man. The bodyguards lay off a bit as he was allowed to bathe among the small crowd of socialites. Some chose to immortalise the moment by posing with him to which he complied with ease. Another friend initiated an absurd conversation in English. The choice of language and topic was probably triggered by nerves but Mr Hariri failed to pick up on it in any way, shape or form. In keeping with the overall evening, his performance remained as flat as a half full can of fizzy drink. Neither the cliché reference to the Lebanon of brotherly love and chic restaurants could turn things around or the lacklustre use of colloquial Arabic to establish rapport with an audience unsure of its own values. In my mind, the unavoidable comparison was one between Hariri and his archrival (in a comic book superheroes kind of way) Mr Nasrallah, who also falls back on colloquial Arabic to emphasize his well-articulated points. The difference being that Mr Nasrallah manages to be entertaining in his sarcasm, buoyed by the confidence of those who are driven by ideology and have the means to implement it. Mr Hariri could be excused for failing to motivate a haphazard group not necessarily committed to his political vision when Mr Nasrallah commands blind authority among hundreds of thousands. This has not always been the case and yesterday’s interaction highlights the breakdown in the contract between the March 14th leaders and their former power base: A contract that was laid down in 2005 and undermined through errors, retreats, betrayals and inconsistencies for which Hariri and his band of courtesans share responsibility. The lack of vision and the absence of a consistent message might explain why the claps were half-hearted and the eyes firmly on the trays of Lebanese delicacies being passed around by oblivious waiters.